KAWS: WHERE THE END STARTS is an exhibition at the Yuz Museum in Shanghai designed by ArandaLasch to present large-scale sculpture in the Great Hall of the museum along with smaller sculpture and paintings in the adjacent galleries. The exhibition engages the massive scale of this former hangar with simple but large architectural elements, a room and a wall, that serve to organize artwork around them. Conceived as a kind of temple, the large room is a space of intense focus accomplished through an illuminated ceiling over the piece, COMPANION PASSING THROUGH. Around the temple is a room of wooden sculptures and a monolithic wall to display CHUM. 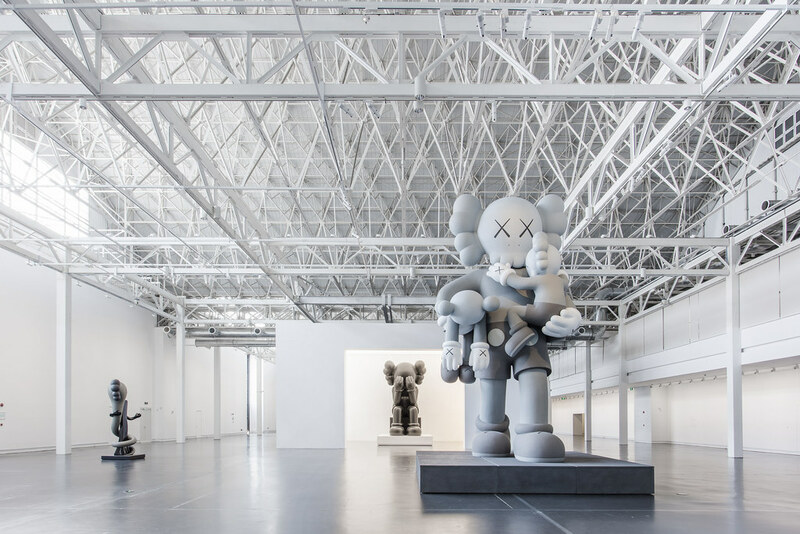 In addition to gathering monumental sculptures, the exhibition provides a comprehensive overview of KAWS’ work across different media in the surrounding galleries. Each gallery displays different aspects of his oeuvre from the black and white pieces to his formative graffiti works to his smaller scale collectibles. KAWS: WHERE THE END STARTS is jointly organized with The Modern Fort Worth and evolves their initial installation in response to the monumental scale of the YUZ. The opportunity to experience so many large-scale works in a vast space offers a new perspective on KAWS’ work and a powerful presentation to his Chinese audience.